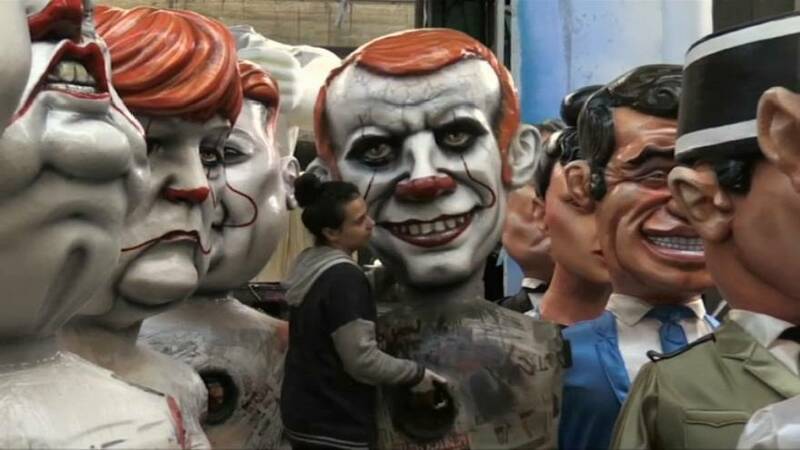 Artists are putting the finishing touches to the giant effigies that will parade down the streets of Nice during the French city's annual carnival later this month. The event, held every year since 1873, will run from February 16 to March 2. This year's theme "King of Cinema" will honour the 100th anniversary of the Victorine Studios — a mainstay of the film industry in the south of France. Among the many giant sculptures of film stars, including Charlie Chaplin and Jean-Paul Belmondo, there will also be caricatures of world leaders including Donald Trump, Vladimir Putin, Kim Jong-Un, Emmanuel Macron and Angela Merkel. A float entitled "super zeroes" will see Macron staged as Captain America, while his Prime Minister, Edouard Philippe, will embody Wolverine. Trump takes on the traits of Gotham villain the Joker, while Merkel and Putin have been made-over to look like menacing clowns. "Politics is a bit like cinema, so it's a good mix of the two," local resident Fabienne Neuville said, in anticipation of the parade.